At the beginning of the Legend of Zelda: Breath of the Wild Link does not have his Hylia shield. You have to search and find it. However, the game gives you no clues as to where the shield might be. Hylia shield is the best shield in the game and has a durability of 800. 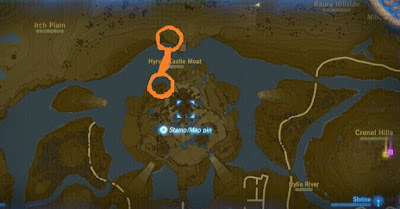 Why you will need the Hylia shield? When the final fight is due, nothing can go wrong together with the master sword and a very good armor. - You should first go through the right cave entrance, which leads you into the dungeon. The dungeon locates to the west of the throne room and lies on the first level. - You can use the magnetic module to lift the gate and get into the dungeon. Alternatively you can also use your cryonis and put an ice column under the entrance gate to lift it. - Alternatively, you can use Revali’s gale to get to Hyrule Castle. You are thrown high into the air and land where you want. - In the Dungeon, some enemies will be waiting for you and also in the cells are opponents who throw some minor rewards when you take them. You get into the dungeons either when their lever is used or by breaking their brittle walls. - You must get to the end of the dungeon, where there is a cell in which a Stalnox waits. You must defeat the creature if you want the Hylia shield. - You must attack the Stalnox's eye, as this is its weak point. Either you go directly into melee or you shoot it with bow and arrow. - At this stage, the Stalnox should not be a problem for you anymore. Use a double-hammock and then attack the eye to bring down the Stalnox quickly. Because with his eye, the Stalnox can regenerate his life and you certainly don’t want that. The Stalnox is a unique opponent who, once you've defeated him, will no longer appear in this place. If you defeat the enemy, a mysterious chest appears where you can finally find the Hylia shield. Grab the best shield and collect the remaining loot. Now Link finally has his Hylia shield and can go into the toughest battles.